Hurt Near East Coast Fishing Ports? The commercial fishing industry is vast, and therefore each geographical region presents its own challenges for landing a catch. East coast fishing ports in Massachusetts, Maine, Rhode Island, Maryland and New Jersey are hubs for groundfish as well as mollusks like the Atlantic sea scallop. Poorly maintained poorly equipment on draggers and scallopers may cause different dangers for fisherman and other maritime workers along the east coast. Maritime law firm Latti & Anderson LLP has been serving the east coast fishing community for generations. For example, attorney Carolyn Latti grew up along the east coast, and has spent much of her life among the fishing community. Latti & Anderson had successfully obtained millions of dollars in verdicts and settlements for injured fisherman and their families. No matter where you sustained your fishing injury, our maritime injury lawyers can travel to you. The main catch along the east coast of the United States includes groundfish like haddock, flounder and cod, as well as shellfish, like the Atlantic sea scallop, oysters, blue mussels and lobster. Georges Bank in the Gulf of Maine, in particular, is a major center of commercial fishing. However, along the east coast, the heavy machinery required for scalloping and groundfishing can easily cause injury if a maritime company does not properly maintain its vessels. Faulty maintained equipment such as trawl nets, winches and other heavy machinery. Improperly repaired equipment and/or vessels. Maritime accidents as a result of fatigue or lack of proper training. Falls overboard due to lack of proper railings, non-skid surfaces and/or safety equipment. All of these maritime accidents can result in serious injuries for a fisherman, and include the additional risk of drowning. Even a seemingly minor fishing injury like a broken bone can prevent a seaman from returning to work for weeks or months. However, our maritime injury lawyers can help ensure that you get the maintenance and cure benefits you deserve while you recover. If you are hurt in a fishing accident, our maritime trial lawyers have the experience necessary to help you win the compensation you deserve. 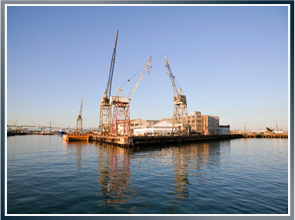 At Latti & Anderson LLP, we are familiar with many local fishing ports, including New Bedford, Cape May and many others. In the past, we have obtained many successful verdicts and settlements against commercial fishing companies large and small. We offer free initial consultations, so it will cost you nothing to learn how we can help you. Contact us online or call today to schedule a free case review at your convenience.